The second and third weeks of Ramadan represent an opportunity for retailers to engage consumers when they are actively purchasing items for upcoming celebrations. During this period in 2015, there was a 128 percent uplift in eCommerce transactions. Criteo, the performance marketing technology company, today released seasonal data in anticipation of Ramadan to help eCommerce businesses better engage consumers during the festive season. Based on consumers’ online browsing and buying activity, the second and third weeks of Ramadan represent an opportunity for retailers to engage consumers when they are actively purchasing items for upcoming celebrations. During this period in 2015, there was a 128 percent uplift in eCommerce transactions. Criteo data also revealed a 75 percent increase in traffic to eCommerce platforms during the same period, of which six in 10 consumers were found to be viewing products across multiple devices. To attract and retain customers during Ramadan, retailers must ensure that their online advertising campaigns are optimized across desktops, laptops and mobile devices. The findings are based on an analysis of 1.5 million online transactions in Indonesia, Malaysia and Singapore before, during and after Ramadan in 2015. “The Islamic holy month is marked by festivities that involve redecorating homes, gift giving or wearing new clothes to welcome visiting friends and relatives. Rising smartphone adoption and more time spent at home as Muslims break their fast together, means it becomes more convenient if essential items are purchased online. During this period, retailers must ensure that they are helping consumers sift through online product inventories to discover what they want and need, by delivering personalized and relevant content,” said Yuko Saito, Managing Director, Criteo Southeast Asia. Criteo’s eCommerce Industry Outlook 2016 and analysis of shopping data from 2015 highlights two additional trends that will impact Southeast Asian retailers during Ramadan. Smartphones have become the first point of brand interaction or product discovery for many consumers. In the past, smartphones were largely used to browse and research products, with transactions completed on desktops and laptops. With more than half of online sales in Southeast Asia currently taking place on mobile, it is clear that consumers are now more comfortable performing transactions on mobile devices. In addition, almost half of the region’s mobile transactions are now completed on mobile apps, rather than mobile browsers. With sales on apps expected to surpass sales on browsers in the months ahead, eCommerce businesses must seriously consider apps as a part of their customer acquisition and sales strategy. This will include improving user interface, monetization tactics and app setup (through deep linking, feed optimization, SDK analytics tools etc. ), and adopting in-app retargeting. “As Islamic traditions impact consumption decisions, we are seeing fashion-conscious Muslim consumers significantly influence retail trends in Southeast Asia. ZALORA has consistently provided our customers in Singapore, Malaysia and Indonesia with a selection of elegant Muslim fashion wear, especially during Hari Raya. We prepare for the Hari Raya season months ahead, lining up activities to build awareness and engage our target audience, especially on our mobile web and mobile app platforms. Criteo is one of our partners in driving this and their advanced retargeting platform delivered a 100 percent sales uplift during last year’s campaign,” said Tito Costa, Chief Marketing Officer, ZALORA Group. “Ramadan is often a busy time for companies offering consumer goods. Increasingly, online stores and mobile apps are joining in the swirl of seasonal promotions, in part to create brand awareness and boost web traffic post-Ramadan. We would advise online retailers to invest in both search engine marketing and retargeting, and draw on data they have collected from users to better understand how and when they shop before, during and after the holiday season. Besides, based on our data in 2015, the purchase power during Ramadhan increased two to three times,” said Sheji Ho, Chief Marketing Officer, aCommerce. Some traditional retailers are already integrating offline and online channels to better serve customers and increase sales. One example is MatahariMall in Indonesia. Apart from launching its eCommerce platforms for web, mobile web and app, the company added 200 online-to-offline points at its existing departmental stores and hypermarts, allowing customers to pick up their online orders and continue shopping in-store. 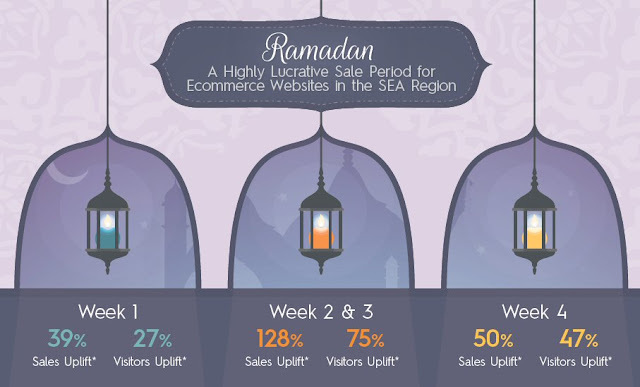 “During Ramadan, eCommerce sites typically experience a significant increase in online traffic. However, 98 to 99 percent of these online visitors do not make purchases on their first visit. It is therefore important that we combine retargeting with an online-to-offline approach. Retargeting encourages consumers to return to our site and complete a purchase. Our customers also shop on the go on their smartphones and our online-to-offline points allow for quick pick-ups and increased foot traffic to our brick-and-mortar stores. This strategy has increased our month-on-month remarketing sales by 160 percent and we expect a further spike during Ramadan,” said Timothius Martin, Head of Performance Marketing, MatahariMall.com. With the majority of consumers now researching online before or while visiting a store, understanding a shopper’s online activity is essential. According to Google, eight out of 10 shoppers with a smartphone are using it inside the store to help them with product research and price comparisons, with most of them eventually completing a transaction at Point of Sale (POS). Retailers can acquire a better view of the customer’s shopping journey by connecting with them via mobile apps or beacon technology, before matching each customer’s email ID with loyalty programmes at in-store POS terminals. “Ramadan is a major shopping occasion, similar to Christmas. During this period, consumers tend to spend more time online, take less time to consider a purchase and request for pick-ups at offline locations or home delivery on short notice. Retailers must recognize the value that mobile technology can bring and use it as a foundational building block to deliver integrated and seamless online and offline retail experiences. This will be crucial to engaging consumers across all channels and increasing sales conversions,” said Saito. For more information on Criteo’s analysis on shopping behaviour during Ramadan 2015, download the full infographic here.